Most of us know that obesity is where a person has high levels of body fat, but at what point does overweight become obese? There are different ways of determining this and one way that many people are familiar with is the Body Mass Index. Body Mass Index (BMI) classifies whether a person is overweight or obese by looking at their weight to height ratio. It is calculated by taking a person’s weight (in kilograms) and dividing it by their height (in meters squared). BMI= weight (kg) / height (m) x height (m). People are considered overweight if their BMI is between 25 and 29.9 and obese if it is above 30. There are different levels of obesity, too. Class I obesity is a BMI between 30 and 34.9. Class II obesity is a BMI between 35 and 39.9. Class III obesity (also called morbid obesity) is a BMI is greater than 40. In recent years, research has determined that waist-to-height ratio is a much better predictor of cardiovascular health risk and a shorter lifespan due to illness than BMI, which is weight to height ratio. A meta-analysis from 2012 pooled data from multiple studies, and examined Waist to Height Ratio (WHTR) in more than 300, 000 adults from several different ethnic groups and found that was a far better predictor of cardiovasular of metabolic risk factors in both men and women, than BMI . 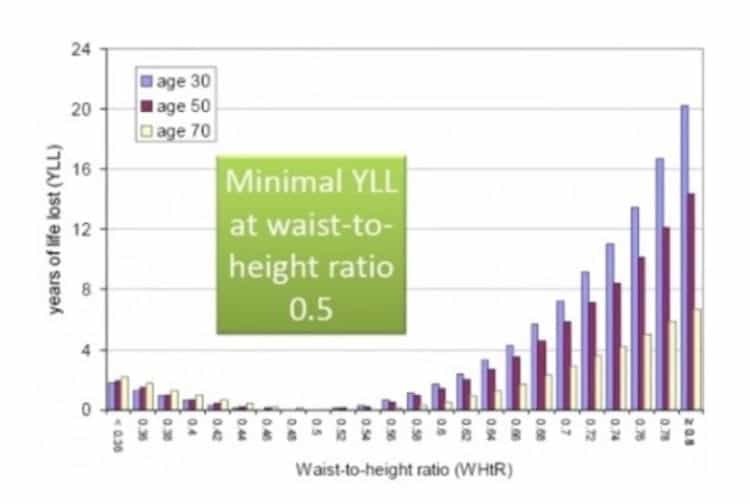 A 2014 study found a correlation between Year of Life Lost (YLL) for different values of Waist to Height Ratio (WHtR) and found that YLL increased dramatically in both males and females when above 0.52 – a waist circumference of just over half one’s height . These two studies found that the least amount of years of life lost is associated with a Waist to Height Ratio of 0.5. That is, our waist circumference should be less than half our height, even if our BMI is in the “normal range”*. *Both males and female non-smokers have a slightly increased Years of Life Lost at waist circumference > 0.50, even when their BMI was in the normal range (18.5 to to 22) – which means that waist circumference is a more important predictor of shortened lifespan due to cardiovascular disease, than BMI. 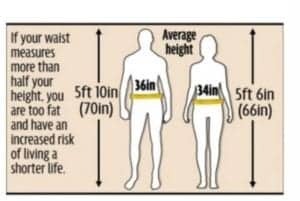 If you’re a male and 5’10” tall (70″ tall), then to be in the lower risk category, your waist circumference should be 35 inches or less. 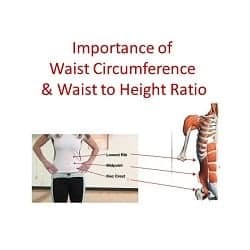 If you’re a female and 5’6″ tall (66″ tall), then your waist circumference should be 33 inches or less. But where should we measure waist circumference? Is it where we wear our pants? Is it at the smallest part of our belly, where it dips in? Is it where our navel (belly button) is? Each one of these will produce very different results. For the purposes of calculating risk associated with increase abdominal girth, waist circumference needs to be measured at the location that is at the midpoint (i.e. half way) between the lowest rib and the top of the hip bone (called the “iliac crest”). Below is a picture that should help. This measurement should be taken with a flexible seamstress-type tape measure, being sure that the tape measure is at the same height in the front and the back, when standing in front of a mirror. That is, the tape measure should be perpendicular to the floor (not higher in the back or the front). It’s also important that the person’s abdomen (belly) is completely relaxed when taking the measurement, not sucked in. One way to do that is to taking a deep breath and let it out fully just as the measurement is taken. If your Waist to Height ratio is greater than 0.5, then you are at increased risk for cardiovascular events and a shortened lifespan. Looking at the graph above, one can see that for every little bit over 0.5, the risk rises steeply. Health is not a number on the scale. Its the measurement of the amount of fat in our abdomen, around our liver, kidneys, pancreas and heart. If your waist circumference is greater than 0.5 you are at risk. If you have been diagnosed with Type 2 Diabetes or pre-Diabetes, high blood pressure or high cholesterol, then this risk is compounded. Add to that a family history of these, and your risks are even higher. While we can’t change our family history, we can change our diet and lifestyle and lower our risk. Attaining a waist to height ratio of 0.5 is often associated with lower blood sugars, lower blood pressure and better cholesterol – even more so when the diet to achieve the weight loss is intentionally designed for these outcomes. If you would like help getting on your own road to better health, please send me a note using the Contact Me form on this web page, and let me know how I can help. 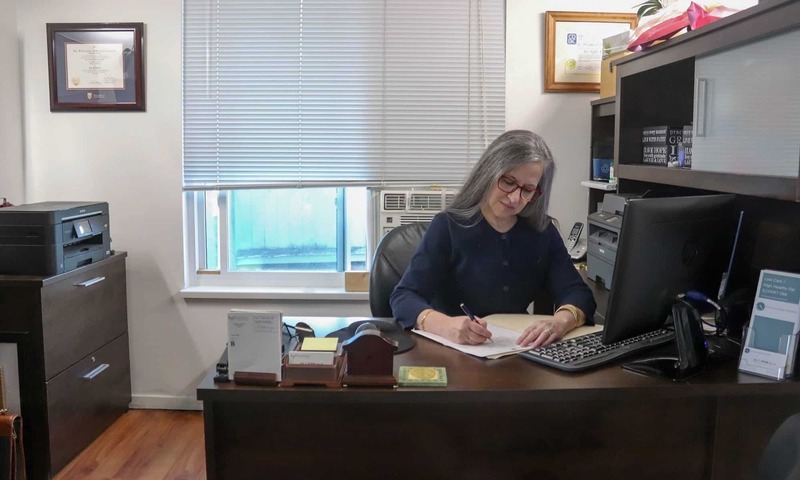 Remember, I provide both in-person and Distance Consultation services via Skype and many extended benefits plans will reimburse for visits with a Registered Dietitian. Please send me a note if you have questions.